Hello, I’m Rokas fully qualified Gas Safe, Nest, Heating Engineer. I was offered to work as a trainee Heating Engineer while studying at University. Very soon I noticed how important is hot water and heating in our homes. Rokas did a wonderful job sorting out my Central Heating system. It was difficult finding the root of the problem, but he was very thorough and checked every possibility until he found the problem. I doubt that any other engineer would have taken the time to do the same. Now I am no longer dreading Winter! 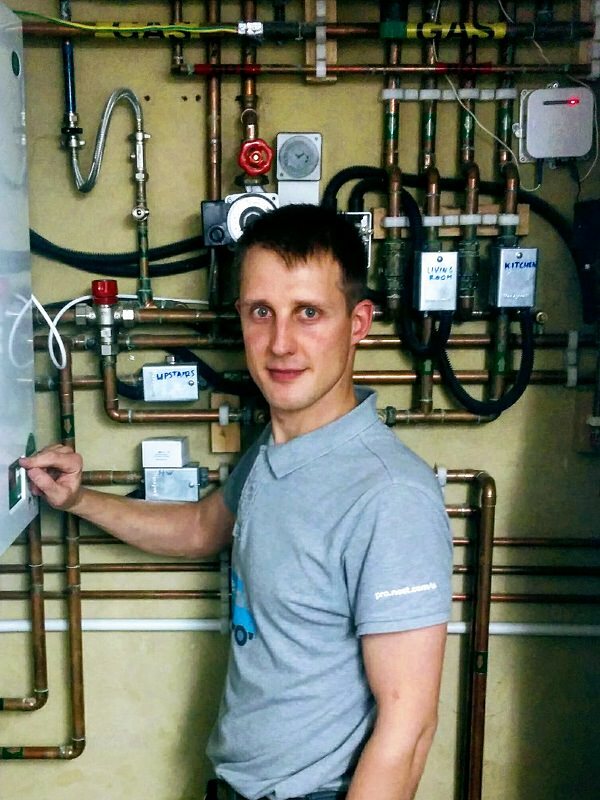 If you are looking for a very professional, competent, reliable and pleasant Heating Engineer – then look no further, Rokas is your man! Being Customer Focused – I always listen to my customer’s needs, talk through and help them to reach their goals in the most efficient way. Being Professional – Constant growth, curiosity and regular training help me to deliver latest technologies, best practice and up to date information to your home. Whatever improvements I make in your home I want to make sure that you understand how to use it to your highest benefit. Being Thorough – I believe that everything consists of small details. So every detail I touch in your home should look beautiful, easy to use/maintain and last longer than anyone expects. Being Reliable – I treat your home with respect and make sure everything is left as clean and tidy as I found. Moreover, every job I do at your home is at the same high standard as I would do for myself. Hello, I’m Rokas fully qualified Gas Safe, Heating, Nest and PowerFlush Engineer. I was offered to work as a trainee Heating Engineer while studying at University. Very soon I noticed how important is hot water and heating in our homes. Rokas installed a Nest thermostat and did a brilliant job. He made sure my heating system was compatible beforehand and brought all necessary equipment with him. He was punctual and let me know by text when he was on his way, which was greatly appreciated. He went out of his way to explain the new thermostat in detail. I'd highly recommend him. Rokas installed 4 thermostats and calmly and professionally diagnosed and fixed the accumulated chaos of 6 previous heating engineers who had left our wiring in a chaotic and incomprehensible state. He worked calmly and methodically through every challenge and left the system in apple pie order, completely understandable to any subsequent worker. In addition he was completely persistent and would not leave until every element of each unexpected obstacle was fixed and resolved. He also explained the thermostats in a user friendly way despite being late in the evening, in an unrushed manner. We have great confidence in his work and are happy with our experience. Rokas is fantastic. He efficiently installed a Nest thermostat for me, while taking into account my needs. Then he explained everything about how to use it, as well as giving me great tips on heating my home. He went beyond my expectations in what he provided.I recommend him to anyone to have a Nest installed. I can highly recommend Rokas, without any hesitation. Professional, punctual, respectful, self assured and a true gentleman. Rokas kept us informed at all times and inspired confidence throughout. You just know you are in safe hands with him. A real gem. Rokas is an incredibly professional gentleman! He installed a Nest thermostat on very short notice and ended up servicing our boiler as well. He was extremely efficient, friendly and accommodating. He went beyond expectation on explaining everything in a calm and professional manner. It's so nice to meet someone as enthusiastic and proud of their profession, it's rare these days. We highly recommend Rokas and will always call upon his help with anything heating related from now on. What a lucky find. Rokas was very quick to respond and do our Nest installation. Rokas was very friendly and efficient and did work to high standard. He replaced our old Honeywell CM707 connected to a district heating system. with a Nest and it works great. He also took time to explain the system in detail. Very happy and would recommend Rokas to anyone needing an installation! I was looking for a heating engineer to install my Nest Thermostat, since British Gas do not provide this service. Rokas got in touch very quickly when contacted, after finding his details on the Nest website. Rokas was most accommodating, and attended on a Sunday - very impressive! Rokas' communication was excellent, letting me know where he was via GPS prior to his arrival. Upon arrival, his expertise and enthusiasm for his craft was apparent, and he carried out the Nest Thermostat installation both considerately and without rush. Having informed Rokas that the existing thermostat was not connected, as stated by two previous gas safe engineers, Rokas took the time to investigate for himself, and it became apparent that the thermostat was indeed connected - this made things easier for Rokas, and probably cheaper for me! I would not hesitate to use Rokas again should I need a heating engineer or gas safe engineer, as he offered expertise, honesty and value for money. Recommended. Honest & friendly, a good communicator. Thorough boiler service and clear communication of repairs needed, which he did once I'd sourced the necessary parts (his recommendation based on lowest cost to me). Plus successful Nest Thermostat installation at very competitive price. Rokas installed a new Nest Thermostat & CO/Smoke alarm as well as giving my boiler a much needed service. He was polite, took the time to explain everything and gave some useful tips on using my heating system more efficiently. I called Rokas in the morning and he was able to accommodate us and come late afternoon. We had no heating and NEST wasn't installed properly due to shoddy workmanship. A lot of problems arose and Rokas was able to tackle each one at a time. He showed patience and efficiency and sorted out heating out. Also explained in detail how to use NEST and answered our questions. Would definitely recommend him..
Amazing amazing amazing! Where do I begin. First off, this ain’t no ordinary plumber but a proper heating engineer with skill, knowledge and attention to installation detail. Rokas knows what he’s doing, I called him to install my Nest thermostat circa 4 years ago. And he did an amazing job there. Though unjust, I failed to initially leave a feedback then. So when we had to do my parents house one can imagine my sense of relief and joy that he was available to do the Nest thermostat there too. This time again he did a brilliant and thoughtful installation. The main reason I’m writing this review here is not just cause of two great installs. But also he highlighted and permanently resolved ongoing heating issues in the house. The century old parents home have been heating issues even after a new combo boiler install (vaillant). But knowledgeable Rokas saved the day & money again, within 1hour he managed to isolate & resolve the issue concerned where others failed.If you need someone that you can trust to get on with an install or anything plumbing engineer related there’s really only one choice! Rokas was amazing. He's quick to respond and set up an appointment. He was running late but kept me well informed, and was positive throughout the installation, keeping my worries at bay. We had some issue with the non-standard router but he was patient enough to deal it with me and took the time to explain how the whole thing works even though he had to run home for his London fireworks display appointment! What a guy.. Definitely recommended. Rokas came to fit our Nest and was so helpful and knowledgeable, we asked him back to service our boiler which was dropping pressure. Again he was fantastic. When I smelled gas coming from my hob today, I texted him and he called me back instantly, pointing me in the right direction. I have two small children in the house and it turned out I had a big gas leak. I am so thankful for Rokas advice. I highly recommend Rokas as he explains everything, making sure you understand exactly what's going on, before going ahead with any fixes. He's very efficient and does a really good job. He installed and set up our Nest system initially. More recently I got him back to help fix a problem with our boiler pressure which is now working great. Amazing service. Rokas explains everything in great detail and installed our Nest Thermostat quickly and efficiently.Update December 2018: I asked Rokas back to look at a longstanding issue with one of my radiators. Two separate plumbers had failed to resolve the problem, but Rokas diagnosed it within 5 minutes and then spent the next hour fixing it. That's the difference between a plumber and a proper heating engineer! Rokas also installed the new Nest Hello smart doorbell for me: it was a tricky job involving new wiring and new transformer, but he did an excellent job. Professional, thorough and friendly...We contacted Rokas for a small job to install my dishwasher, he carried out the task to a high standard and kept us informed during the entire process ensuring we were happy with what he planned on doing before he did it. No job is too small, he was friendly and thorough and took his time which made me feel like a valued customer. I would highly recommend Rokas and will definitely contact him in the future when I need a reliable plumber/gas engineer! Rokas came to our flat to fit a Nest and also give our boiler it's annual service. He was professional, polite and explained every step of the process extremely thoroughly. He was in constant touch before he arrived, texting to let me know his arrival time. When he was in the flat he worked quickly and efficiently, and then when he was finished he immediately emailed the invoice to me so that I could pay by bank transfer straightaway. Job done! He was a pleasure to deal with and is a thoroughly nice chap - I would recommend him to anyone. Rokas is a gentleman and a professional. He installed my Nest in no time flat, and a year later rescued us from a terrible boiler tradesman experience when we were without heat. When I rang him he came the next day, identified the issues, went to get replacement parts and then tracked down a water leak in our covered heating pipes which he then fixed in a very difficult spot in the house. 10/10 would ring him again without hesitation.He’s also very responsive, proactive comunicator - he even messaged us a week later to make sure the leaking corner pipe was still good to go :)Oh, and he also fixed our faulty light switch! Rokas is simply amazing after struggling to get my Nest Thermostat installed by different engineers through AXA 3 times!! Rokas came and installed it with simplicity and corrected there mistakes. He is knowledgeable, professional and polite and even showed me everything I needed to know about the Nest Thermostat. I would 110% recommend him for any Nest installation and anything boiler related. Thank you for a fantastic service. I can help you with any Gas, Heating related question. Please give me a call on 07513524811 to discuss further or leave me a message and I will get back to you shortly. Please describe what needs doing and your preferred days, times. I will get back to you with an estimate or final quote.